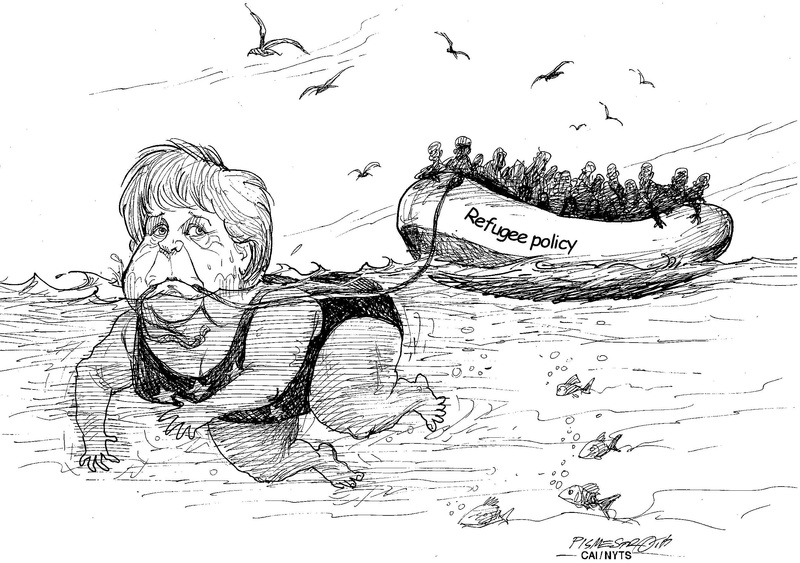 BERLIN - German Chancellor Angela Merkel may have adjusted her policies after last year’s refugee influx. But last Sunday, she was punished anyhow by voters in her own constituency of Mecklenburg-West Pomerania. That’s one sign that the European Union’s migration crisis is far from resolved yet. The mere possibility of being sent back to Turkey has reduced the daily number of Greek island arrivals to 111 in August from 6,360 in October 2015. It’s a psychological effect that is not mitigated by the obvious tension between Turkey and the EU, caused on the one hand by Europeans’ unease about President Recep Tayyip Erdogan’s authoritarianism and on the other hand by the Turkish resentment of the EU’s slowness in sending financial aid for refugees and abolishing short-term visas for Turks. Even an arrangement as shaky as this one introduces extra uncertainty into a fleeing Syrian’s already high-risk plans. Besides, countries along the migration route from Turkey have reinforced the route’s negative publicity: Macedonia, for example, has all but closed its border with Greece. It’s clear by now though that far from solving the problem, this kind of word-of-mouth deterrence has made alternative, longer and more dangerous routes of migration look comparatively more attractive. On certain days, the number of refugee arrivals in Italy matches the high levels seen in the Greek islands last year. In August, the average number of arrivals reached 686 a day, up from 263 in October 2015. Most of these arrivals come through Libya, a country with which the EU is not able to make a deal similar to the Turkish one. The country’s “government of national accord” has rejected the possibility because it doesn’t want to commit to take any refugees back: The Libyan state has no money, no infrastructure and not enough authority to house refugees the way Turkey does for the 2.7 million Syrians it has temporarily settled in host communities and camps. Since Europe can’t send them back to Libya, that makes the route preferable to the Turkish one today, even though the chance of dying at sea is much higher on a Libya-Italy voyage than on a Greek-Turkey one. That explains why the number of migrants who die or go missing at sea hasn’t gone down since last year: 3,169 of them have died or disappeared so far in 2016, compared with 3,777 for the whole of 2015, and the run rate is actually higher than last year. Most of the deaths occur on the so-called central Mediterranean route, the one to Italy and Malta. Italy is wealthier and less bureaucratically inept than Greece, so it has served as a better barrier for migrants hoping to end up in northern Europe. In May, Austria even stopped the construction of an anti-migrant wall on the Italian border, reassured that the influx was under control. And yet Germany hasn’t really noticed. According to Germany’s Federal Office for Migration and Refugees, more asylum petitions were filed in January through July this year than in all of 2015 — 479,620 compared with 476,649. The number of applications is actually increasing rather than dropping. While the number of new arrivals has dropped because of the stricter policies, the migration service — whose budget, staffing and efficiency have been boosted this year with the help of $10 million worth of McKinsey’s consulting services — has been processing a huge backlog. The steady influx of new applications means that more people are still arriving and that some who arrived before these attempts began in earnest are still undocumented. This means they haven’t even begun to integrate into Germany society and the labor market, even if they plan eventually to do that. 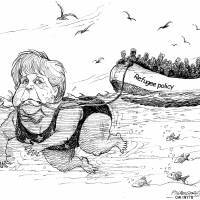 The presence of hundreds of thousands of new arrivals in a bureaucratic limbo does nothing to fix Merkel’s political problem. In Mecklenburg-West Pomerania, her party lost just 4 percentage points compared to its 2011 performance, and it will probably still be part of the ruling coalition headed by the Social Democrats, who won a plurality just like in 2011. And yet the CDU was overtaken by the anti-immigrant Alternative for Germany (AfD) party, which, with 20.8 percent of the vote, is now the second strongest in the state. That’s not a tragedy — Mecklenburg-West Pomerania is a small state, and AfD won’t govern it — but the party’s performance has been unprecedented for a German right-wing force, and it poses a danger for Merkel if she decides to run for chancellor again next year and for her center-right party if she steps aside. German domestic politics dictate the need for a less makeshift solution to the refugee crisis than the Turkey deal. Other big European countries — especially Italy as an increasingly important point of entry and France, where long-distance truckers are protesting against the increasingly unruly and dangerous migrant camp near Calais, known as the Jungle — also need a more lasting solution, but their leaders cannot expose themselves to the kind of backlash that Merkel has been facing. Their positions are not as secure as hers was to start with. But if these countries can’t take in more people, the options for a coordinated European solution are pretty much limited to sealing the union’s external borders — a costly proposition that would be difficult to execute, especially with elections looming in several big nations. The crisis is far from over, and it won’t be while the Syrian war and the anarchy in Libya continue. Europe can’t be an impregnable fortress, so it needs to be a stronger force for peace.